Creative Miniaturist: The FREE Spring Issue is Out Now! The FREE Spring Issue is Out Now! 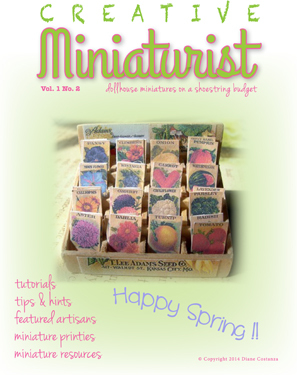 Hello and welcome to the Spring 2014 Issue of Creative Miniaturist! clearing out the clutter of Winter with miniatures in mind! and create wonderful dollhouse miniatures instead!! Just click on the Spring Issue below and enjoy! Just discovered your magazine a few days ago, thank you, I like that is not too big and that you focus mostly on tutorials. Thanks for leaving a comment, Elga and I am glad you are enjoying the new issue. Hola Diane, soy tu nueva seguidora. Yo también me dedico a hacer miniaturas a partir de cosas recicladas. Un abrazo. Hello, great to see you here. If you ever have any of your projects to share, please contact me! my heartbeat faster. Sorry for my English; it is rather poor, but I suppose you understand I made you a compliment for your Magazine. I am from Holland in Europe, so I only studied English, it is not my mothers language, but I am sure you'll understand my writing. I am 73 years old and I hope to make miniatures untill I am about 150 years old; more ideas than time. Waiting for the next "Creative Miniaturist" I send you my regards. Rya, Your english is just fine, much better than some Americans I know, LOL! Thank you for stopping by to leave a comment. I am always looking for contributors to the magazine, so if you are ever so inclined, send me an idea for an article or tutorial and we can feature your work in the e-zine! !